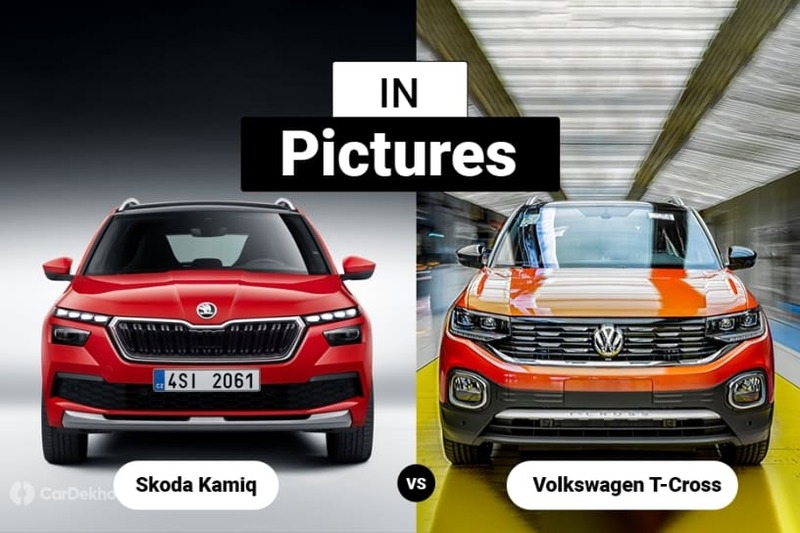 The Skoda Kamiq and Volkswagen T-Cross will kickstart a new innings for Volkswagen Group’s mainstream brands in India, starting from 2020. After over eight years, Volkswagen and Skoda will introduce all-new locally manufactured products since the Polo in 2010. While the VW T-Cross was revealed in October 2018, the Skoda Kamiq was unveiled in February 2019. Both the SUVs are likely to be showcased at the 2020 Auto Expo followed by their launch, most likely in the second half of this year. Here's a pictorial comparison of the two global-spec compact SUVs to see how similar or different they are from each other. Note: Both the India-spec Kamiq and T-Cross are expected to look relatively more rugged than their international models, with subtle aesthetic changes. Also, the T-Cross is available in two wheelbase measurements (Brazil/China-spec with 2,651mm and Euro-spec with 2,563mm). And since India is expected to get the larger wheelbase model, we have used images of the same. The design of both the SUVs is inspired by their bigger siblings, Kodiaq and Tiguan, respectively. The Kamiq has a split headlamp setup, something we have also seen on SUVs from Hyundai and Kia. The T-Cross, on the other hand, has a conventional headlamp layout. Full-LED headlamps are offered on both the SUVs, but the Skoda Kamiq packs dynamic turn indicators as well. Underpinned by the same MQB A0 platform, both SUVs have an identical wheelbase of 2,651mm. While the Kamiq is slightly longer than the T-Cross, the VW is marginally taller. Both the SUVS offer upto 18-inch alloys, however, the India-spec models are expected to get 17-inchers. Ulike the Volkswagen, the Skoda features a clamshell bonnet and a rear quarter glass. The rear quarter glass should make its cabin feel relatively airier. Like the front, the rear too carries forward the family SUV look for both. That said, the T-Cross features connected tail lamps, unlike other VW SUVs such as the Tiguan, but the wraparound layout of the tail lamps with geometric LED elements are in line with the brand’s styling. The Kodiaq gets sculpted wrap-around tail lamps, also seen on other Skoda SUVs. While the Kamiq’s interior will inspire future Skoda models, the T-Cross’ cabin has been lifted straight from the new Polo (yet to be launched in India). The infotainment displays are placed very differently in the two. While the Kamiq gets a free-floating setup which is popular nowadays, the T-Cross’ dash-embedded unit is positioned conventionally. The Skoda Kamiq and Volkswagen T-Cross feature VW Group’s 10.25-inch fully digital instrument cluster which is expected on the India-spec models as well. The digital instrument cluster also displays full-screen navigation maps. Features expected on the India-spec SUVs include panoramic sunroof (already on offer globally), dual-zone climate control with rear AC vents, wireless phone charging and leather upholstery. The Skoda Kamiq offers upto 9.2-inch display for the infotainment system. On the other hand, the T-Cross packs upto 8-inch display, same as the new Polo. The India-spec SUVs are expected to get an 8-inch system in their range-topping variants. The Euro-spec Kamiq gets Octavia RS inspired sporty front seats, whereas the T-Cross features regular ones. It remains to be seen what will be on offer on the India-spec models as both are expected to share components like seats, for economies of scale. The Kamiq has a 400-litre boot which can be expanded to 1395 litres with the rear seats folded down. The VW T-Cross, on the other hand, features variable boot space, thanks to the sliding second-row seats. Depending on the position of the second row, the boot space of the T-Cross varies between 373 and 420 litres. Moreover, like the Kamiq, the rear seats also fold flat to expand the space further.